Winter, 1944- 1945. 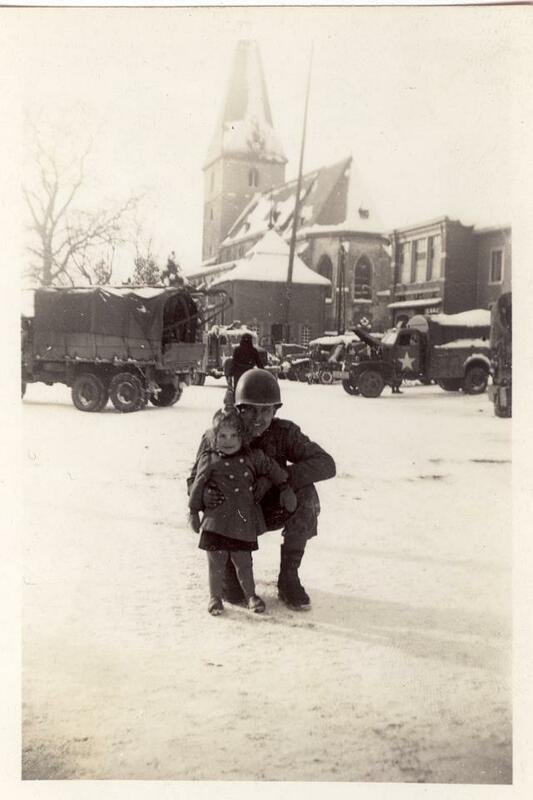 Noorbeek, the Netherlands: Unidentified member of the 38th Signal Battalion with three year old Dutch girl. In the background are the village church and the battalion’s vehicles including a truck with a crane which would have been used in the battalion’s construction work. Four photos are from December, 1944 to March, 1945 when the battalion was stationed in Noorbeek, the Netherlands, including the one above. The smile on the little Dutch girl is among the best illustrations of the joy of all we liberated from the Nazis. Three photos are from the September, 2004 inauguration of two plaques to commemorate the 38th’s service in Noorbeek. Those plaques symbolized the unbreakable bonds of enduring friendship between America and those we liberated. Polish Roman Catholic Cardinal Joseph Glemp died on January 23, 2013. The New York Times’ report on his death reviewed his history of anti-Semitism. What he did and said caused great harm to relations between Slavic and Jewish Poles and between Poles and the world community. That damage lingers to this day. Both the tiny Polish Jewish community that survived WWII and the Holocaust and the Jewish community worldwide needed thoughtfulness, compassion, and support from Polish leaders. Instead he continued to make anti-Semitic statements and engage in antisemitic behavior. On issues that required the most sensitive of words, he repeatedly chose harsh anti-Semitic language. He harmed efforts for post-WWII reconciliation between Slavic and Jewish Poles. He disgraced the memory and service of the great number of Poles who paid with their lives fighting the Nazis and rescuing their Jewish friends, neighbors, and fellow citizens of Poland from the Nazis. His anti-Semitism adds to the confusion that lingers to this day that because the Nazi death camps were geographically located in Poland, they were “Polish” rather than forcibly imposed on conquered Poland by the Nazi occupiers. The ensuing firestorm reignited old controversies in a largely rural land where the prewar Jewish population of 3.5 million had dwindled to a few thousand. But the cardinal did not back down until the Vatican reaffirmed the pope’s determination to move the convent. The issue resurfaced in 1991, when Cardinal Glemp, touring the United States, encountered more protests and told Jewish leaders that he regretted the pain his statements had caused. In 1997, Cardinal Glemp belatedly rebuked a rabidly anti-Semitic radio station, Radio Maryja, and the Rev. Tadeusz Rydzyk, who mingled daily outpourings of hate with prayer. The cardinal acted only after Vatican hints and a prosecutor’s slander charges. 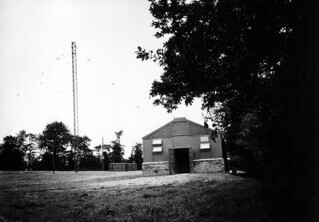 Signal Corps communications building, tower, poles, and lines, Valonges, Cotenin Peninsula, France, 1944. In the summer of 1944 my late father Felix A. Cizewski was stationed at Tamerville near Valognes while serving in Company C, 3110th Signal Service Battalion. He may have assisted in the construction of the poles and wires around this facility as Company C was the 3110th’s Open Wire Repair Section with pole and wire construction and maintenance responsibilities. A new page has been added to the Unofficial Informal Archive of the U.S. Army Signal Corps in Northwest Europe in WWII on the Cizewski, Lovetere, Musbach, & Robinson Family History site. Georges Dennebouy of Saint-Malo, Bretagne, France is a member of a group which searches the Cotenin Peninsula for American aircraft downed during the 1944 Normandy Campaign. While searching they found the bivouac site at Tamerville of Company C, 3110th Signal Service Battalion, Army Service Forces. Felix A. Cizewski, my late father, served in Company C stationed at Tamerville from July 26 to August 18, 1944. Company C was probably working on the wires and poles at the major communications center at Valognes (photo above). Georges Dennebouy and I have been researching what other units were stationed there. The new page lists the two infantry regiments, two units of a medical battalion, four downed planes, and several Signal Corps units we have identified to date. Neither the list of units nor the details of their service are complete. Documenting and sharing the stories of those who served at Tamerville and Valonges honors their service and preserves their memory. Anyone with more information may share it with Leonard H. Cizewski and it will be added to the site. Page one of the Emancipation Proclamation from the National Archives and Records Administration. Union soldiers held a variety of opinions the abolition of slavery. Union soldiers from slave states probably hoped to restore the Union without the abolition of slavery. However, Union soldiers from free states such as my ancestor-in-law Anson Croman from Michigan were probably unanimous in their opposition to slavery. They did not appreciate their free labor competing with slave labor. Slavery Footprint asks on its Web site, “How many slaves work for you?” A survey poses a series of seemingly innocuous…Upon completion, a number is revealed: (Professor Masur) discovered that 60 slaves work for him. One way to reduce our complicity and attack human trafficking is to participate in Made in a Free World, a platform started by Slavery Footprint to show companies how to eliminate forced labor from their supply chains. Working to abolish all forms of slavery worldwide may be one of the best ways to honor the service of our Civil War ancestors. How Many Slaves Work for You? by Louis P. Masur, New York Time Op-Ed, December 31, 2012. The Emancipation Proclamation National Archives and Records Administration. Anson Croman and the Civil War. The Musbachs and Robinsons are direct line descendents of Anson Croman.